There are a few names in the New York design circuit that you must know and Calico Wallpaper is definitely one of the front runners. Their work is beautiful, luxurious and brings a whole new modernity to wallpaper. Once researching more into the design couple’s design processes and inspiration, I found that it was their connection to old traditions, handmade approach and meticulous attention to detail that adds an entirely new dimension to the beautiful high end wallpaper that we see. Nick and Rachel Cope of Calico Wallpaper are that cool New York couple we all dream a little bit about being. Quitting their old jobs and combining their complementary talents and passions to create their wallpaper brand was not only an inspiring tale to fuel your American Dream, but one laced with a bit of romance and Japanese tradition - and don’t we all love that? Discover how they made the jump, combine traditional and digital methods and how they grew their business to the most talked about wallpaper designers of our time. 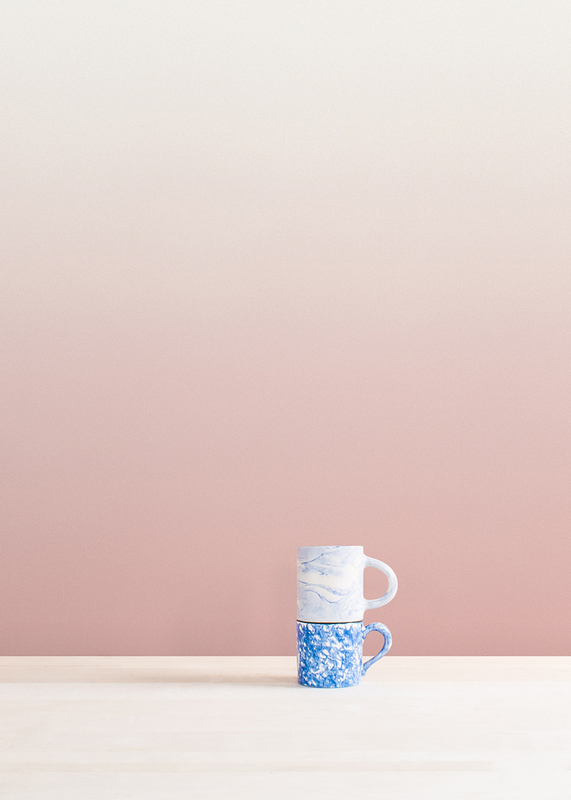 | Nick | My wife Rachel and I are Calico Wallpaper, based in Red Hook, Brooklyn. We create immersive spaces. We do so by taking artwork that is made in studio by Rachel and then I digitize and customize it based on the size of the walls where it will be installed. We have a lot of fun doing it! | say hi to_ | What is a typical day at work for you? | Nick | The workday officially begins at 9 AM when we arrive at studio, just a few minutes walk in an old brick townhouse. We are in the top floor and faces East so our studio gets lots of light and the space is airy and beautiful. Our team arrives and we have a design meeting to discuss current projects, tasks at hand, and even touch on a bit of development work if we are lucky. I spend a lot of time discussing opportunities, collaborations, and key projects. Rachel handles order fulfilment and makes sure that our project system is running smoothly. When we get caught up with the work in our pipeline, we love to sit down and brainstorm on new collection releases. It’s kind of random and hilarious, but our studio is directly across the street from one of the largest IKEA stores in America, so we will occasionally sit in fake living room or bedroom settings and discuss a work crisis or two. | say hi to_ | What did your parents do? Did it influence in one way or another what you do now? | Nick | Rachel’s mother was a key figure in her childhood. As a school art teacher Susan encouraged Rachel to spend a lot of time painting, drawing, and collaging in Martha’s Vineyard when she was young. Her dad was bond trader who pivoted careers and opened a charter school, he also spent a lot of time in his carpentry workshop for fun and shared his knowledge with young Rachel – there are stories of her torch-welding with her Dad when she was just a little girl. Because of their efforts, she was always into process-driven artwork. | Nick | My parents were more hands-off when it came to influencing my work, however indirectly they passed a lot on to me that affected Calico Wallpaper. My mother practices feng shui, an ancient Chinese art of harmonizing space and my grandmother was a long time antiques dealer, specializing in East Asian relics so I always had an appreciation for interiors and the special objects that inhabit them. My father was a financial planner and he didn’t exactly have an eye for space design – he operated his own business and showed me that it was possible to live independently as an entrepreneur. | say hi to_ | When did you know you wanted to be a designer/artist? What did give you that idea and encouraged you to do so? | Nick | I intensively studied photography at NYU and entertained being an artist for a time, but then lost focus when I fell in love with travel and returned to New York after a 3-year stint abroad. After working in a different roles in the interiors industry (as a contractor, interior designer, and even decorative painter at times) I settled into product design in the most unlikely way. A true story – Hurricane Sandy hit New York in 2012 and I found all of my projects on hold during a major citywide blackout. More notably, the psych unit where Rachel was practicing as an art therapist was closed for 6 months and she was placed on a paid (!) leave. It was during this period that we began to experiment with design collaboration and the rest is history. | say hi to_ | What did you study and do you think in retrospect that a university degree was necessary or worth the price for what you’re doing now? | Nick | I think that depends on where you go to university, if it’s public or private, etc. In the United States a private education like NYU or RISD is pretty pricey these days. Despite grants, scholarships, and loans one is still left with a mountain of dept. That said the digital design skills that I learned and the variety of studio arts courses that Rachel took were indispensable in creating our design brand. | say hi to_ | Did you have any odd jobs along the way? | Nick | I had more than an odd job… I’ve actually started 3 or 4 odd companies along the way. The most prominent was a company called Green Painting, which was an eco-focused interior construction firm specializing in house painting, decorative work, and wallpaper installation. It was a success and I worked with some top clients, built a close relationship with the British manufacturer Farrow & Ball, and completed some brilliant projects. It was all fun, but being a designer is so much more my speed. At the end of the day I like expressing myself creatively and find that there is so much more that is possible with a product than a service. | Nick | Rachel worked in a variety of psychiatric hospital settings and has the most fascinating and odd stories from her years there. Of course, they are all protected by medical confidentiality, so I don’t even know them myself! | say hi to_ | Did any of those influence you at all or did you learn things there that come into play now? | Nick | Both of our experiences play in to our work at Calico Wallpaper on a daily basis. Rachel’s work really prepared her for the typical dealings with clients, managing a team, and dealing with complex social issues. She’s really an expert in communication and always treats others in an extremely sensitive manner. On the other hand, I was always working independently and learned a great deal from operating different business – there were elements to law, accounting, marketing, servicing, and a host of others that helped prepare us for starting this business in a professional manner. | say hi to_ | We read that you use the arts of Suminagashi and Ebru, from Japan and Turkey, which was created centuries ago in your creation methods. Can you briefly explain what those are and how you came to learn them? | Nick | I stumbled upon some incredible large prints of marbleized paper in a favorite curiosities shop in the East Village and shared them with Rachel. They were mostly in the Ebru style, which opened the door for further research into paper marbling and all of the incredible and various disciplines that have emerged around the world. In fact, Rachel had extensively marbled as a child and was very quick to become confident in marbling at large scale. | say hi to_ | How did you integrate those traditions with modern technology? | Nick | My background in digital design made it a fairly easy transition. Since we quickly saw a compelling style in our patterns we then decided to translate these artworks into something suitable to architectural scale and therefore began to test out a myriad of printing techniques. I had spent countless hours at NYU’s Advanced Digital Lab and understood the necessities of color matching, proofing, and all of the Photoshop and Illustrator skills necessary to build good patterns. | say hi to_ | Using these techniques, it must be difficult to make large quantities of wallpaper, how long does it usually take to create one piece? | Nick | Every project is labor intensive and requires an engagement with our clients that lasts weeks and months. We find that that the architecture and design community enjoy the tailoring and customization that goes into each project. We deliver our orders in 10 weeks approximately and occasionally folks request a rush, which we are happy to do for a fee. | say hi to_ | Are all pieces handmade or do you also do prints? How does that work? | Nick | We create artworks by hand in studio and then digitize them so they can be custom printed based on the size of the surface where they are installed. We do have original prints that are quite large (approx 100cm x 150cm) and are quickly discovering a market for them as well. In the future, these original prints might be available for purchase through our website directly or perhaps even a gallery. | say hi to_ | Do you feel there is a revival in using traditional techniques or crafts in the design industry? How would you see the relationship between tradition/innovation? | Nick | There is most definitely a revival in traditional technique and craft in the design industry. It has been well documented at this point and seems to influence food, fashion, design – really all aspects of life. I suspect that there is a longing for objects that have a story and there is a compelling quality to things that are made by hand. Of course, there are many storied brands out there (we look up to brands like Pierre Frey, Kasthall, de Gournay, Zuber) that are able to innovate consistently by building upon the foundation of so many years in operation. | say hi to_ | Can you describe your production process? What are your different roles and strengths in the company? | Nick | We produce everything that is digitally printed through a close partnership. The printing is extremely sophisticated and requires our involvement on every project to insure that color, scale, and pattern is perfectly oriented for our clients. In our company both Rachel and myself wear many different hats, my role involves more of the business development and strategy while Rachel focuses on order fulfilment and sales. We both come together to work on creative direction and essentially design each collection together. It works out nicely! | say hi to_ | A lot of creatives are worried they won’t be able to support themselves. When did you start really making money and how long did it take? | Nick | This part was a challenge I have to admit! We had to float the company by taking resources from my Design/Build firm and fortunately Rachel was on a paid leave while the psych unit where she was working was being repaired from the storm. We also needed to roll our sales into building our business and continued to do so for some time until we had the financials in place to get a business loan. | say hi to_ | How did you know what to charge the first time you had a client? In the very beginning, when we launched at Architectural Digest Home Design Show in New York, we actually had no pricing in place. It was so funny when the first person asked us the price and we had no idea! We quickly sought advice from a variety of confidants and brought on one consultant as well who has previous experience as a buyer, which was all very helpful. | say hi to_ | Is one of you or both of you experienced with business handling, accounting or something similar, or did you learn about this by doing? | Nick | I take the lead on a lot of the business handling as I have started a few businesses in the past, however I have learned a lot from watching Rachel work. Her approach to task management is incredible – she’s so productive it’s incredible. | say hi to_ | What was the hardest? | Nick | The hardest thing was everything. There are so many facets to creating a company – the design is most critical, but there are simply so many time-consuming elements such as production, marketing, accounting, and staffing. When we started, things like customer service never entered our minds but now we are growing up as a company and trying to address every nuance to the business and improve! | say hi to_ | Was there a moment when something really encouraged you not to give up? | Nick | There have been a few milestones but winning ICFF’s Best Wall-Covering and Architizer’s A+ Award both came at the same time during last year’s design week in New York, which was a particularly stressful time. We were in the midst of launching three new collections and only a couple of months before our first baby Willow was born, which added to the sleeplessness. Those awards, and great press from exhibition at Spazio Rossana Orlandi in Milan, where all very encouraging. | say hi to_ | What do you have in pipeline next? | say hi to_ | What is the DNA of New York and how does this reflect in your work. | Nick | New York is all about hustling as cliché as that sounds. There is so much that you can accomplish in one day here, it’s mind-boggling. So many great people, resources, clients, and inspiration that are all interconnected. Best coffee in New York ? We are fans of Cafe Pedlar in Cobble Hill and of course La Colombe on Lafayette St and elsewhere in Manhattan. But in truth there’s no good coffee in New York, better to go to Milan for a nice espresso. Best co-work space in New York? We’re big fans of WeWork, they are also our clients and love our wallpaper. Also, NeueHouse is a great achievement - such a beautifully designed space with an amazing ambience and terrific synergy amongst the members. This is so tough. There are a million options, but in fact I love an old bar called Sunny’s in Red Hook, Brooklyn. It’s one of the oldest bars in the city and has been in the same family since it opened way back in the 1800’s. Folk from all over the city swing by on Saturday to play in a wild jam folk-y session. This one is easy - Spirit & Matter on 10th Street in the East Village. It’s owned by an interesting Englishman named Rick Gallagher who has a wide array of curiosities and a ton of stories share. New York is just filled with new design studios – it seems like a day doesn’t pass that some interesting and compelling new voice enters the dialogue. In the same way that we are also up and coming, we are fans of Helen Levi, Ladies & Gentleman Studio, Material Lust, and Brian Thoreen (though he is LA based). We often take our clients to La Compagnie des Vins Surnaturels, a lovely wine bar with delicious small plates. It was brilliantly designed by Paris-based interior designer Dorothée Melichzon who used a variety of our wallpaper patterns and has a wonderful cozy atmosphere. Write me – nick@calicowallpaper.com - I’ll advise where I can! Thank You Nick & Rachel!